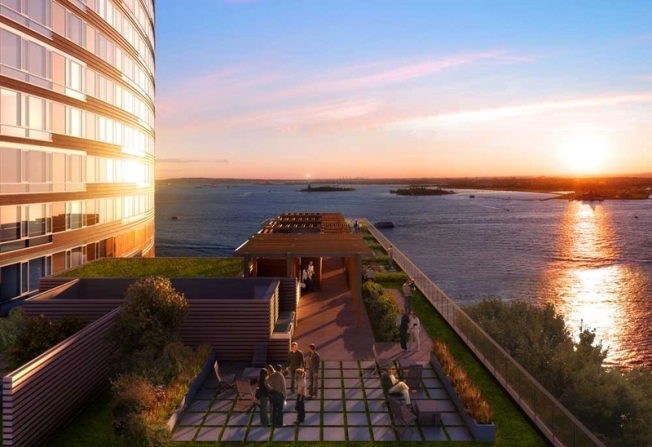 Green Building Reaches New Heights at "Visionaire"
The green-roof deck overlooking New York Harbor at the new green condo development "The Visionaire." New York's ever-expanding skyline has a new kid on the block – but this massive tower is setting itself apart as "America’s Greenest High-Rise Condominium." The 35-story Visionaire in Battery Park City was designed by architect Rafael Pelli of Pelli Clark Pelli Architects and developed by the Albanese Organization, in partnership with Starwood Capital. According to InteriorDesign.net, the building is expected to land LEED Platinum certification from the U.S. Green Building Council. The 251 studio-to-three bedroom residences are focused on green innovation. “At the Visionaire, cleaner air, filtered water, energy efficiency and natural resource conversation are as essential as innovative design, abundant light, and captivating views,” the tower’s developers said. Combined, the green features are expected to slash energy consumption by 35 percent, compared to similar code-compliant buildings. A savvy water treatment system will recycle water throughout the building, using it for an HVAC system cooling tower, and rainwater will be collected to irrigate two rooftop gardens. Many developers and architects say green design, with a focus on sustainability and energy efficiency, will become the standard in urban development.